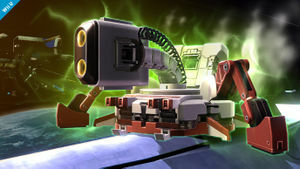 Super Diffusion Beam (スーパー拡散ロボビーム, Super Diffusion Robo Beam) is R.O.B. 's Final Smash in Super Smash Bros. 4. When activated, R.O.B. transforms into a laser cannon and fires an intense beam of energy at the opponent. The attack starts off as a large beam that can trap opponents in place. The large beam then splits into four smaller ones, each at a different angle. Like Samus's Final Smash, Zero Laser, the beam can be aimed at a slightly vertical angle. The attack ends with a final burst that sends opponents trapped in the large beam flying. For R.O.B. 's Final Smash, he folds his arms down, transforms into an invincible cannon, and fires a huge beam that can be panned slowly up and down. The beam splits up partway through into smaller beams that drag foes to the center, where they'll be hit continuously. The assault finishes off with a single wide beam just for good measure. For R.O.B. 's Final Smash, he folds his arms down, transforms into an invincible cannon, and fires a huge beam that can be aimed slowly up and down. The beam splits up partway through into smaller beams that drag foes to the centre, where they'll be hit continuously. The assault finishes off with a single wide beam, just for good measure. Super Diffusion Beam in Super Smash Bros. for Nintendo 3DS. Super Diffusion Beam in Super Smash Bros. for Wii U. This page was last edited on March 22, 2019, at 19:16.